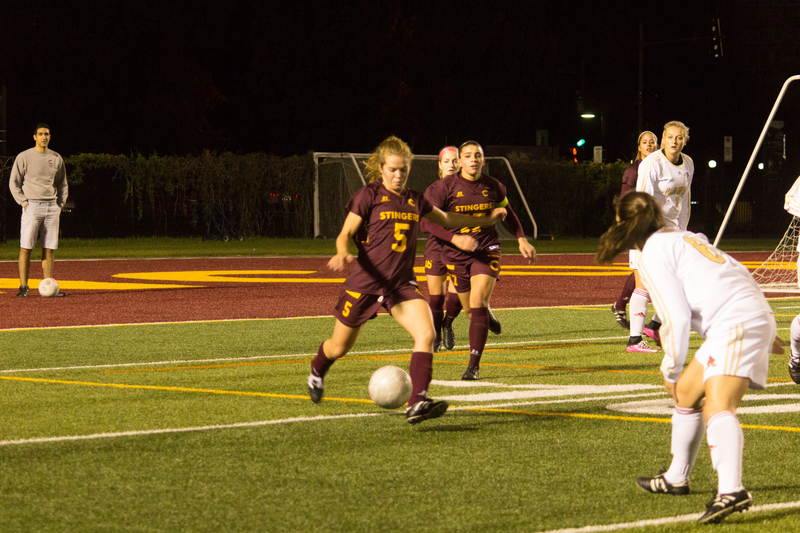 The Concordia Stingers soccer teams suffered through disappointing and heartbreaking seasons. Both the men’s and women’s teams missed the playoffs for a fourth straight year. In case you missed all of the action, here is a recap of their seasons. The men’s team missed an opportunity to qualify for their first playoffs since 2012 by only three points. The team finished with a record of 4-6-2, just one win shy of the fourth and final playoff spot, which went to the Université de Montréal Carabins. Head coach Greg Sutton said in an interview at the beginning of the season he would be disappointed if they did not make the playoffs. Even though they just missed their goal, the Stingers should have a lot of hope moving forward. The men’s team just barely missed the playoffs this season. Photos by Ana Hernandez. Their 14-point season total is a vast improvement from the past two seasons in which they only earned a combined total of 14 points. In 2014, they went 0-7-5, followed by a record of 3-9-0 last year. The team also featured three Réseau du sports étudiant du Québec (RSEQ) all-stars. Defender Olivier Georges was named to the first all-star team, while defender Amadou Lam and goalie Karl Gouabé were named to the second all-star team. The last time RSEQ named three Stingers to its all-star teams was in 2002. All three players were instrumental in the team’s solid defence, although Lam was playing out of position in the left back role instead of in his natural midfield position. Lam tied with three others—strikers Sebastien Boucley and Gabriel Quinn, and midfielder Abdallah Medouni—as the team’s leading scorers, with four goals this season. The Stingers have the pieces in place to do damage next season. The majority of the team is in their first or second year, with only five third-year players. With a fantastic goalkeeper, a solid midfield, speedy wingers and prolific strikers, the Stingers could have the playoffs in their sight for next season. The women’s team’s season was a disappointing one. The Stingers finished with a record 2-10-2, 17 points out of the playoffs. The games in which they got a result—a win or a tie—were all against non-playoff teams. Head coach Jorge Sanchez said late in the season he was expecting the program to grow this season, but was upset his team is regressing from past seasons. Their past seasons include records of 5-9-0 in 2013, and 3-6-5 in 2014. Last year, they went 4-9-1 and missed the playoffs by only two points. There isn’t much they are doing different statistically. They scored 14 goals and conceded 35 this year. In the 2015 season, they put up similar numbers, scoring 18 and allowing 31. Yet, they finished last season with five more points. The Stingers were unlucky that two of the top teams in the country play in the RSEQ. The Université de Laval Rouge et Or finished the regular season ranked as the number one team in U Sports, and the Carabins finished fifth. Stingers captain and defender Alyssa Ruscio was named to the RSEQ all-star team. Forward Laura Lamontagne, who led the team with five goals and three assists, did not make the cut, however.